Russian President Vladimir Putin on Wednesday met with Russia Chief Rabbi Berel Lazar and the President of Jewish Communities of Russia, to discuss joint efforts to combat anti-Semitism and neo-Nazism. The meeting was also attended by rabbis from Israel, Austria, Belgium, Germany, Italy, the Netherlands and France. During the meeting, the parties discussed joint efforts to prevent the ‘rewriting of history’: the fight against neo-Nazism and neo-fascism, as well as xenophobia and anti-Semitism. “We consider you, in this regard, our closest allies and ask you to consider us and as such,” the Russian President added. 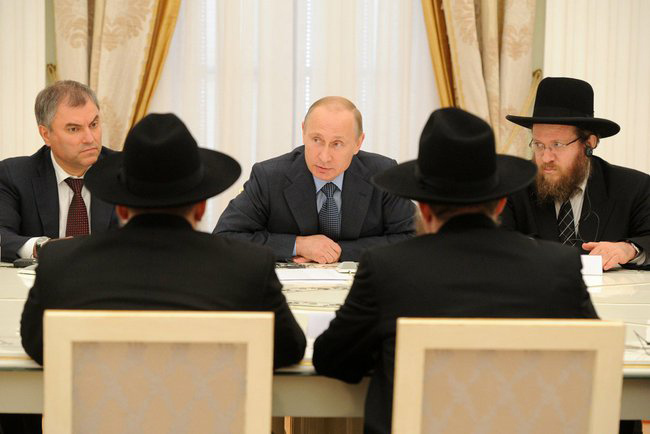 During the meeting, Putin noted that the meeting took place on the eve of the anniversary of the tragic events of July 1942, when thousands of Jews were murdered in Sevastopol. “In Russia we will not only never forget these tragedies; furthermore, we will always cherish the memory of the dead, and we will do everything we can to prevent a recurrence of similar tragedies in the future,” he said. “For us, it is very gratifying to see how it is in Russia, a country where the Jewish way of life was previously banned, that such a dynamic Jewish community exists now. We are grateful to the government for its support and for the fight against anti-Semitism,” he added. The problems of growing anti-Semitism in Europe and throughout the world were addressed by the foreign guests — Rabbi Yitzhak Yosef, Rabbi Jacobs, Rabbi Lieberman and Rabbi Yisrael Meir Lau. The latter also thanked the Russian authorities for the fight against anti-Semitism and told his personal story of how a Russian soldier, Fedor Mikhailichenko, saved his life in Buchenwald.